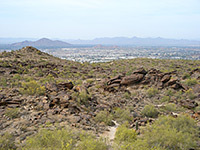 The main scenic drive through South Mountain Park (Telegraph Pass Road, aka Summit Road) ends at Buena Vista lookout, from where many square miles of the Phoenix suburbs are in view, nearly 1,000 feet below. Footpaths lead off in several directions including the Geronimo Trail to the north, but the most popular route is the National Trail, in particular the first 1.5 miles of the eastbound section, which cross undulating, bushy land to a secluded basin known as Hidden Valley. Entry to either side of the valley is via a narrow gap in the surrounding rocks - Fat Man's Pass on the near edge and a natural tunnel on the far side. Including the loop through the valley, the round trip hike is 3.5 miles long and takes about 2 hours. The National Trail is also open to horse and mountain bike traffic but the Hidden Valley part is for foot travel only. Panorama of Hidden Valley. Full screen version (27 mb). The well used path first crosses a short stretch of hillside to a saddle above a southeast-trending ravine, the lower end of which is bordered by a new housing estate in west Chandler, just 1.5 miles away from the pristine desert on the mountain top. Past here the trail moves back to the north side of the mountains and stays close to the ridge summit though always a little way below the highest part. The open countryside allows frequent glimpses of Phoenix to the north but the majority of the route is over flattish land, kept out of sight of the city by intervening rocks. The path has a few climbs between longer sections of gradual descent, and for much of the way runs in or along dry sandy washes, passing numerous large granite boulders and plenty of cacti, most prominent being the ubiquitous saguaro. Lizards are much in evidence, and even the usually secretive chuckwalla may often be spotted. Rattlesnakes are quite common, especially in early morning and early evening. A junction after 1.5 miles marks the edge of Hidden Valley; the National Trail veers off northwards and a slightly narrower, rougher path enters the basin, rejoining the main trail on the far side. 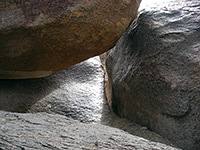 It soon reaches Fat Man's Pass, a passage between two smooth-sided boulders just one foot wide; large-framed people can easily bypass the gap, if required. 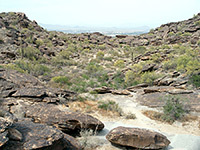 The valley is filled with rather bigger rocks than the surroundings, still with many saguaro, and the trail winds its way across by following a dry wash. Some places require a little scrambling, where the streambed drops a few feet over pour-offs. The path exits the basin via a second narrow passage, formed by several huge boulders lying on top of a narrow ravine, creating a natural tunnel. One side of the passage has nice, eroded formations, making this the most photogenic part of the hike. Not far after the tunnel the path meets the National Trail once more, from where a steep walk westwards reaches the start of the loop again, after passing another junction (with the Mormon Trail).